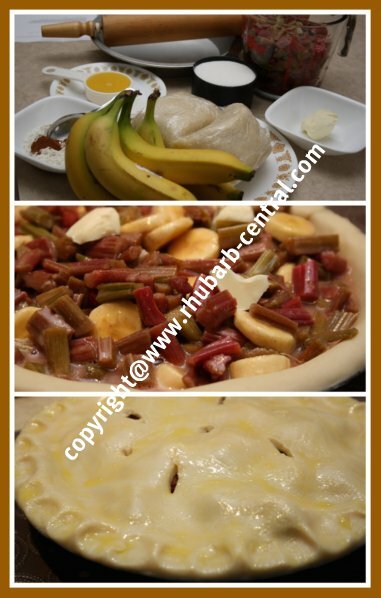 This Rhubarb Banana Pie Recipe, see the pictures! makes a cool rhubarb pie idea that is quick and easy and AMAZING! 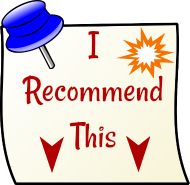 Someone passed me this recipe recently, and I was anxious to try it. 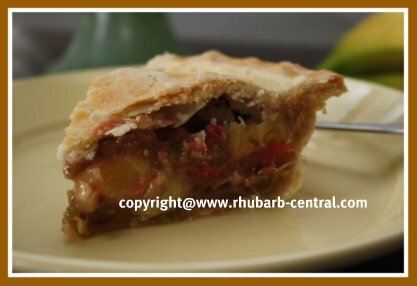 If you've got fresh OR frozen rhubarb on hand, and bananas, why not make something different than plain rhubarb pie? My daughter Karissa, (who is the family "pie maker"), made it yesterday, and it tastes scrumptious! 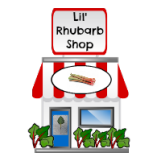 It's fun pairing rhubarb with different fruits (even though rhubarb is a vegetable! ), creating unique and flavourful treats! 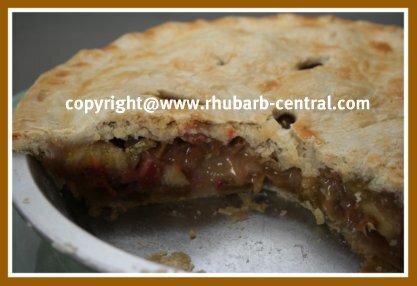 Note - You can use fresh or frozen rhubarb for this rhubarb banana pie recipe. If you are using frozen rhubarb, thaw it in a sieve, over a bowl, and discard the excess liquid before using the rhubarb. 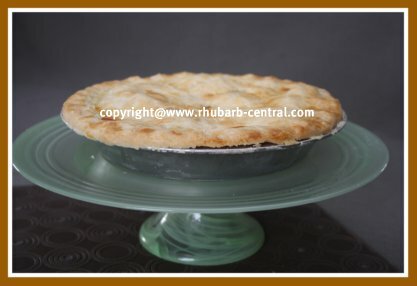 Since rhubarb tends to "shrink" when it is thawed, be sure to thaw enough rhubarb to ensure that you have 3 cups of thawed rhubarb for the pie. Prepare pastry for pie crust. Roll out half of the pastry dough to a 12-inch circle, and line a 9" pie plate. In a large bowl, combine the chopped rhubarb, sliced bananas, sugar, orange juice, flour, salt, cinnamon and nutmeg. Spoon the mixture into the pastry-lined pie plate, and dot the top of the mixture with the pieces of butter. Using a brush (or your fingers! ), apply the beaten egg to the crust edge of the pastry in the pie plate. This is optional. Applying the beaten egg to the pie dough provides for more "even baking" of the pastry, and gives the pie a nice colour. Roll the remaining pastry into an 11-inch circle for the top crust. Place the top crust over the filling in the pie plate, and flute the entire edge. Cut out a small center "hole", and a few, (about 4), additional "vents" in the top pie crust. Apply a thin coat of the beaten egg over the entire top crust of the pie (optional). Bake at 450° F for 15 minutes, then reduce heat to 350° F, and continue to bake the pie for about 40 minutes or until fruit juices bubble through the vents, or steam escapes from vents. I like to add the pie crust shield (see link below), after about 30 minutes of the pie baking. 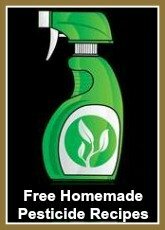 Serve warm or cold, plain, or with a dollop of ice cream, whipped cream, Greek yogurt, or whipped dessert topping! 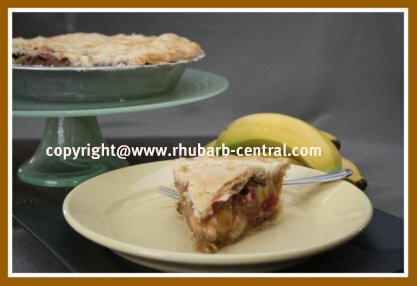 ENJOY this Rhubarb Banana Pie Recipe! Do you ever have issues with the edges of your pie crust becoming too dark? Make a pie crust shield! Are you making many different types of pies on one day? Check out the following link for a helpful tip on how to differentiate the different pies!